The Tsog offering is a profound part of the Guru Puja (Lama Chöpa in Tibetan) regularly held at FPMT Centers. Tsog means gathering. We gather together the things we’re offering, and we ourselves gather together to do the practice. Gathering together with other practitioners, concentrating our minds into the same space, gives us great inspiration. It’s much better than just doing puja alone in our own rooms. This is the Tibetan connotation of tsog. 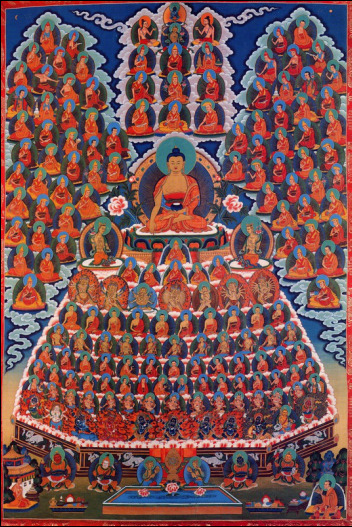 Tsog in the Tibetan tradition is a most profound method of purification, a profound way of gaining realizations. When you recite the text in English you can see how many subjects are included in the practice. The Guru Puja, for example, covers the entire path to enlightenment from beginning to end. So it can happen that in your daily meditations on the lamrim you’re not making any obvious progress, then suddenly during a puja, because of the conducive atmosphere you’ve created, zoom! — some realization comes into your mind. Many people have gained realizations during a puja simply because of the atmosphere. Another connotation of tsog is ‘party’ — a party at which we share simultaneously born great wisdom and bliss. Now that’s a party.